To robbers and thieves, an unoccupied home can seem like a prime target. Your upgraded security system will make sure they steer clear at all times. Throughout the day, you’ll easily be able to check in on your home’s current status. You can control every aspect of your system just by using one smart device. 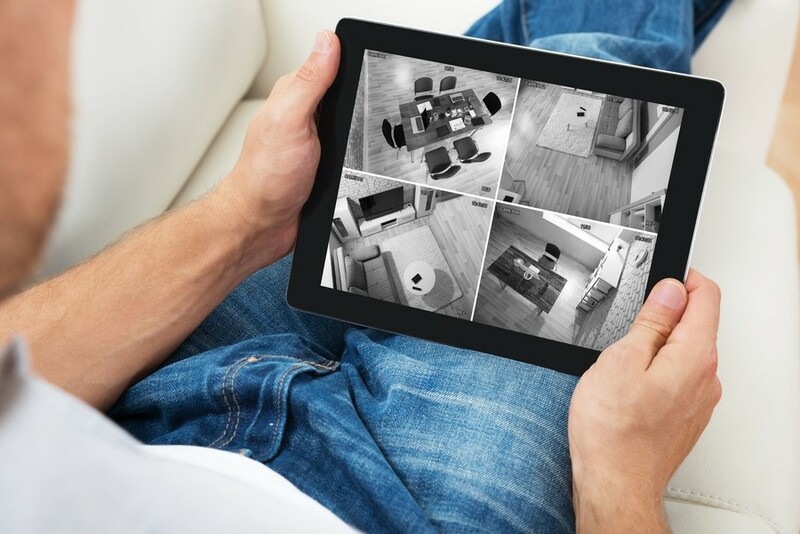 Use your smartphone, tablet, or laptop to view your surveillance camera footage. You can adjust the camera angles, make sure doors are secured, and turn on your safety alarms – all with the press of a button. You can integrate other technology from your home and control it all from the same device. Pair your lighting control with your motorized shades and utilize both with your security. Set your system to “away” mode once you’ve left. This schedules your lights and shades to turn on and off during the day. It will imitate your daily routine and activities, making your home appear occupied – and will keep intruders away. Don’t spend your vacation worrying about whether or not your home is taken care of for you. Enjoy your time off with friends and family – all the while knowing you can rest assured that your property is protected and safe. Now you can know the second something happens at your place. Your system can immediately alert you by sending instant notifications to your phone. Whether a burglary, fire, or flood damage occurs – your system can send an alert to your phone right away. It can even be for a door that’s left unlocked or slightly ajar. You’re also able to set your system to alert the right authorities to handle the situation if need be. Surveillance cameras often get a bad rap for not showing you events until it’s too late to do anything about them. But your security system allows you to watch real-time surveillance footage right on your own smart device – no matter where you are. Use any smart device of your choice to check in on the live videos your cameras are capturing. Your instant notifications will let you know when any movement has been detected or if your system senses suspicious activity. Then you can immediately check in on it. Place your cameras strategically all around your property so you can see every and any angle. You can look at your camera’s view at any time, see all feeds at once, or save the videos and clips to view later. Use your smart device to pan, tilt, or zoom in. You have absolute control over your home’s surveillance from wherever you are – near or far away. Want to enhance your home’s security and surveillance? Give our team a call or fill out our online contact form to schedule a no-obligation consultation. We’d love to hear from you!